Hiking is a great way to get outside and experience the magnificent beauty that nature has to offer. Regardless of where you live, there is likely somewhere near your home where you can leave your troubles behind and go for a hiking trip in a scenic location. However, it is important to ensure you are well-equipped before hitting the trail. Without a quality pair of hiking boots that are both comfortable and effective, the entire hiking trip is likely to be much less pleasant. On the other hand, by ensuring you have a quality pair of hiking boots - or hiking shoes - you can feel comfortable while out hiking, without fearing starting to fatigue too quickly or suffering from discomfort during the trip. In fact, many who are able to find the hiking boots that are truly perfect for them enjoy wearing them during everyday activities, rather than only wearing the boots while hiking. In this guide, you will learn how to choose the best pair of hiking boots for you personally by learning more about the different types and using our hiking boots checklist to ensure the boots you choose meet all of the necessary requirements for your specific hiking needs. Not all hiking books are created the same, and there are essentially three different types of hiking boots to be aware of: day hiking boots, hiking shoes and backpacking boots. It is important to be aware of the differences of each type of hiking boot in order to make an informed decision as to which is best for you. Day hiking boots are intended to be used for single day trips or perhaps even everyday purposes outside of hiking. What separates a day hiking boot from a hiking shoe or backpacking boot is its flexibility and ability to provide a full range of motion with the foot, which many find to be much more comfortable than a boot that is less restrictive. Day hiking boots are usually mid to high cut and essentially a balance between a hiking shoe and a backpacking boot, although it may not provide the durability of a backpacking boot or practicality of a hiking shoe. A hiking shoe is intended for hikers who prefer a lightweight shoe that still provides the durability and damage resistance needed during a hiking adventure. A hiking shoe is usually low cut - although they can be a mid-cut model as well - and are very useful on short, leisurely hiking trips. Many find it helpful to wear hiking shoes in everyday life, such as wearing them to work, going for a jog in the morning or recreational activity in the afternoon. If you like to take relaxing trips that are do not require a high level of effort, then a hiking shoe may be the best option for you. We also wrote another popular guide on how to buy hiking boots, which you should read to see options and how to purchase these boots and shoes. A backpacking boot is hands down the most durable type of hiking boot, which makes them perfect to wear on long hiking trips or trips that require you to carry a heavy backpack. Although they are heavier, they are designed to resist damage that shoes are often exposed to while on long hiking adventures. Another reason many love backpacking boots is due to their ability to keep you safe while hiking. Backpacking boots are high cut in most cases, and they provide unmatched ankle support. If you plan to go on long trips or simply want to stay as safe as possible while hiking, backpacking boots are a great option. Choosing a hiking boot is unfortunately not as simple as deciding which type of hiking boot you prefer. Instead, you must also have a full understanding of hiking boot material and ensure the material of your boot is appropriate for your hiking purposes. When choosing a hiking boot material, you are likely to come across three different materials, which are split-grain leather, full-grain leather, and synthetics. Split-grain leather is a fabric comprised of a combination of synthetic material and leather. The most compelling part of split-grain leather is that it encompasses the most significant benefits of both leather and synthetic material. The leather adds durability to the shoe and makes it more water-resistant than a purely synthetic material. The synthetic components of split-grain leather allow the shoe to breathe easier and makes it lighter than full-grain leather. The only drawback to split-grain, however, is that it does not accomplish each benefit to the full degree, meaning it is not as water-resistant and durable as full leather and is heavier and less flexible than synthetic. Full-grain leather is what it sounds like - almost wholly comprised of leather. Many hikers prefer full-grain leather as it is much more durable, more water-resistant and provides more overall support for the foot than a split-grain leather or synthetic. Full-grain leather is perhaps the most recommended type of hiking boot material for those who plan to set off on a long, vigorous hiking adventure. The obvious drawback to full-grain leather is it is far less breathable than other materials and makes the boot feel heavier. As it pertains to hiking boots, virtually anything that does not consist of leather is considered to be synthetic. The most common materials used in synthetic hiking boots are polyester and nylon. Those who prefer synthetics over a form of leather enjoy the lightweight feeling the material provides to the shoe, and they are often much more breathable for the shoe as well. While synthetic boot material is a good choice for those who only plan to go on day hiking adventures and primary goal is to feel comfortable while hiking, they do not provide the durability or support as leather and are much less water-resistant. Each person has their own specific set of needs when it comes to choosing the best hiking boots, so, unfortunately, there is not a universal answer as to which pair is the absolute best-hiking boots to purchase. Instead, it is essential to have a full understanding of precisely what your hiking needs are, what the weather conditions will be when you plan to hike, and then consider multiple options and make an informed decision as to which pair of hiking boots is right for you. The process of choosing the right pair of hiking boots should contain the following four stages. First and foremost, it is important to have an idea as to the specific conditions you will be hiking in. Will there be rain or snow? How long will the trip last? How much gear will I have? There are certain aspects of choosing the best hiking boot that are not subjective, meaning it is important to have a certain type of boot in certain circumstances. For example, if you plan to go on a long hiking trip in a humid area where there is a high chance of rain, then it is important to have a shoe that is somewhat breathable. If you plan to go on a long hiking adventure in the mountains, then durability and safety may be the most important factors to consider. By first determining your specific needs and preferences, you should then have a better of what type of hiking boot is right for you. After factoring in the conditions in which you will be hiking under - along with other factors such as the duration of the trip and how much gear you will be carrying - you should then have a reasonably clear indication as to which type and material of hiking boot you need. However, your work is far from over. While it is essential to understand the type and material of boot needed, not all hiking boots are created equal, and it is important to consider multiple options before making your final decision. Be sure to check out our selection of hiking boots at Angel Outdoors and compile a list of several different hiking boots before making your final decision. The intended purpose of this guide is to equip you with the knowledge and insights necessary to make an informed decision as to which hiking boot is right for you. With that in mind, we have compiled a hiking boot checklist for you to go through when determining whether or not a hiking shoe fits your specific needs(see below). You are likely to come across multiple different hiking boot options that you like after compiling a list of possibilities - especially when choosing from our well-researched list of best-hiking boots. Before making your purchase, go through our checklist and make sure the shoe you want meets your exact needs. After you have gone through the first three steps on how to choose your pair of hiking boots, you should feel confident in one or more options. In the event you are down to one hiking boot, in particular, then be sure to purchase with confidence, knowing you did your due diligence to select the right pair. If you have multiple options you still really like, then make your decision based on personal preference as there likely is not a wrong answer. Now that you understand how to choose hiking boots correctly let us follow up by providing you with our hiking boots checklist. Several factors are important to take into consideration when choosing a pair of hiking boots, regardless of the exact purpose for them. These critical factors to consider when selecting hiking boots include comfort, fit, durability, appearance effectiveness, and price. Once you find a hiking boot you think is right for you, run it through this hiking boots checklist and verify it meets the criteria. It can be easy to forget to choose a pair that is comfortable to wear when considering several hiking boots, especially if staying safe and finding a shoe that can last for a long time is a priority. However, if the hiking boot is not comfortable for you, then you are not going to want to wear it. Due to this, it is essential to consider the comfort level of a hiking boot, in the same manner, you might consider any other pairs of shoes. 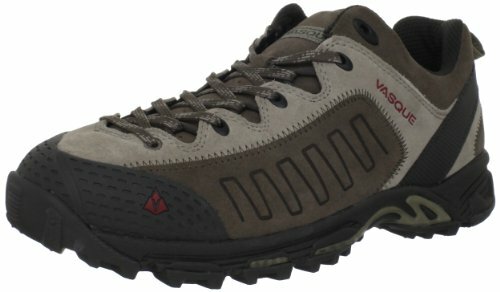 For those who are looking for the most comfortable pair of hiking boots that is still durable and provides good support is the Vasque Men’s Mantra 2.0 Gore-Tex Hiking Boot. The lightweight polyurethane insole and the soft, cushion-like rubber on the outsole makes this one of the most comfortable hiking boots on the market. While there are times when staying safe and finding a shoe that can endure the weather, rocks and obstacles take precedence over the comfort - such as long trips through rough terrain - you are still going to want a hiking boot that keeps you comfortable and feeling good throughout the journey. When considering comfort, be sure to understand the type of material you prefer and only choose full-grain leather if you are okay with the level of support it provides. While it may seem obvious, many hikers forget to consider the fit when choosing the best hiking shoe for them. While in some cases this may be a result of neglect to find out their shoe size, buying a shoe that does not fit properly can also be a result of measuring at the wrong time or not measuring properly. You should also make sure that the hiking boot you purchase fits naturally, and the size you need is the size you get. In other words, there are simply some shoes that fit better than others. 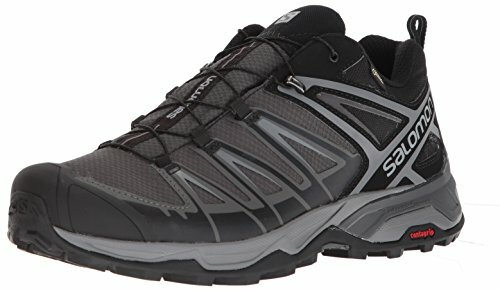 The Salomon Men’s X Ultra 3 Mid GTX Hiking Boot is a good example of one of the best fitting hiking boots. When measuring your foot, it is essential to know more than just the length. Instead, you should also measure the width and arch length of your feet as well - which can quickly be adequately done by visiting a shoe store and using a professional fitting device. Your feet also swell as the day goes on. This means the length and width of your foot may not be the same size in the morning as it is in the evening. To ensure the fit is correct with your hiking boot, measure your foot in the evening or at night rather than in the morning. One of the most important considerations to make when choosing the right hiking boot is the level of durability the shoe provides. Ensuring the durability of your shoe is appropriate is about more than only buying the most durable hiking boot available as doing so can cause you to compromise on the comfort and effectiveness. However, the fact of the matter is some boots are simply going to last longer and resist more damage than others. 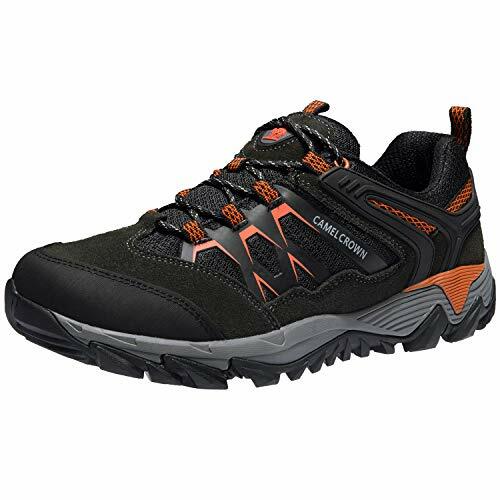 The Timberland Men’s Chocorua Trail Mid Waterproof is most certainly one of these shoes. Made of 100 percent waterproof leather and anti-fatigue technology, you are certain to have this pair for years without needing to replace them. As mentioned previously, long trips call for more durable hiking boots, and a form of leather material is most likely required. For shorter trips in which you will not be carrying as much weight, perhaps giving a little on durability and resistance to adding more comfort is acceptable. The weather conditions are also essential to know in determining how water-resistant the hiking boots need to be. Appearance is the very last thing you should consider when choosing the best hiking boot for you, but it should have some bearing on your final decision, especially if you are considering several options that meet all of your specific requirements. The fact of the matter is you are less likely to enjoy a pair of hiking boots that you think are ugly or “not your style.” Due to this, take one last moment and consider what you would like your hiking boots to look like. 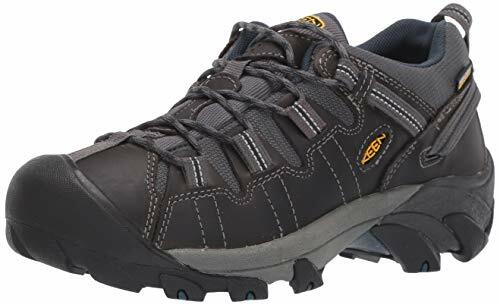 The XPETI Men’s Thermador Waterproof Hiking Boots are a good example of hiking boots that are both effective while out on the trail and stylish. If you prefer something simple and with a reasonably basic appearance - as perhaps most hikers do - then make an effort to choose accordingly, assuming doing so does not compromise the effectiveness, durability or comfort of the shoe.If you want a hiking boot that captures the attention of others more, do not be afraid to make a bolder stylistic decision with your hiking boots. Perhaps the most important consideration to make when choosing your hiking boots is the effectiveness of the boot in the conditions you will be in. After determining when and where you are going to go hiking most often, you should have a good idea as to the type and material of hiking boot you need, which should guide your shortlist and effectiveness should be the first thing to determine with each pair of hiking boots you consider. 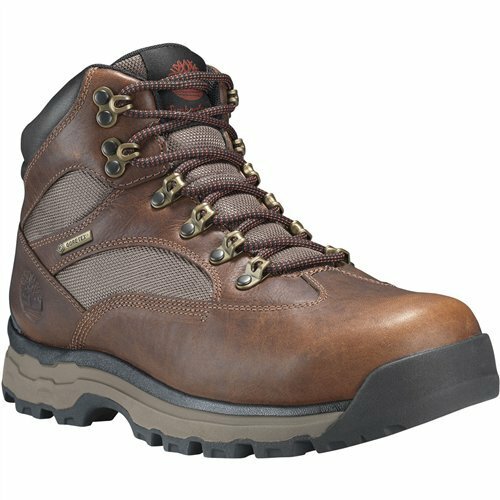 An example of a hiking boot that provides exceptional ankle support and durability is the KEEN Men’s Targhee II Mid Wide Hiking Shoe, which is designed to provide the most amount of support possible for the heel and ankle. Less harsh terrains in good weather do not require as much durability or traction, whereas a mountainous terrain might require solid ankle support and good traction, leading the weight of the shoe to play a lesser role in your decision-making process. Other factors to consider when determining the effectiveness of a particular hiking boot include the temperature, how often you wear them and how much support they need to provide. Nobody enjoys discussing the price with anything, but the unfortunate fact is your budget does play a role in the hiking boot you choose. If you have a more limited budget - or merely place more emphasis on other hiking gear items - then you should only look at hiking boots that fall within your price range. Otherwise, you run the risk of purchasing a pair outside your price range and feeling the financial consequences. If you have a more generous budget, you can consider more options. 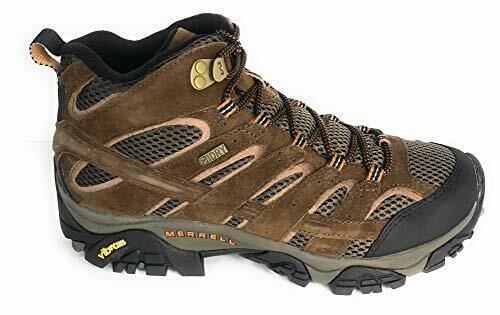 For those looking to purchase a quality hiking shoe but only have a limited amount of money to spend, the Camel Crown Men’s Outdoor Leather Hiking Shoe is a great place to begin your search. It provides exceptional support out on the hiking trail, is very comfortable and stylish enough to wear on an everyday basis. However, a lower budget does not mean you cannot purchase a quality pair of hiking boots, but instead you may have to search and determine your exact requirements differently. For instance, instead of choosing a full-grain leather pair - which may cost more money - find a couple of durable split-grain leather boots that meet all of your other requirements. If you are looking for the right pair of hiking boots, then you probably are in need additional hiking clothing and equipment as well. When hiking, it is essential to stay prepared adequately at all times to ensure you are as safe as possible at all times and can focus on enjoying the beauty that surrounds you. Each person is different, and every hiking trip is unique, which means the attire that should be worn along with the proper set of hiking boots is unique to each hiker. However, there are certain items you are going to want to have along with hiking boots on each trip, regardless of the specifics. First and foremost, be sure to dress appropriately and prepare for the weather conditions you will be in. If you are going to be hiking in cold weather, consider wearing compression socks that keep your feet warm. If there is a chance of rain, make sure the socks you wear are also water resistant as well. Water-resistant hiking boots are not likely to do you much good if your socks get soaked. In addition to keeping your feet warm, you are likely going to have many other items to carry that you deem essential on the expedition. 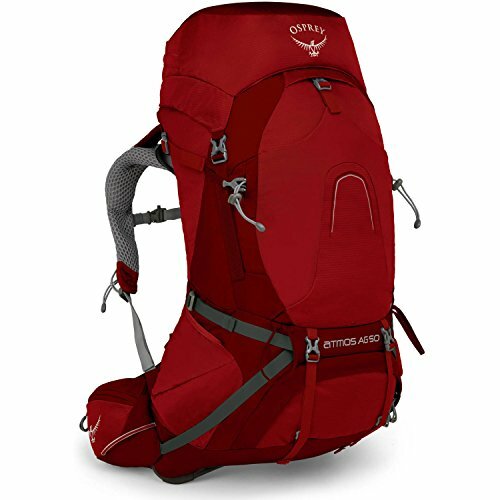 Whether you only plan on setting off for a short hiking trip or intend to go camping, it is critical to have a quality backpack or daypack to carry all of your essentials. 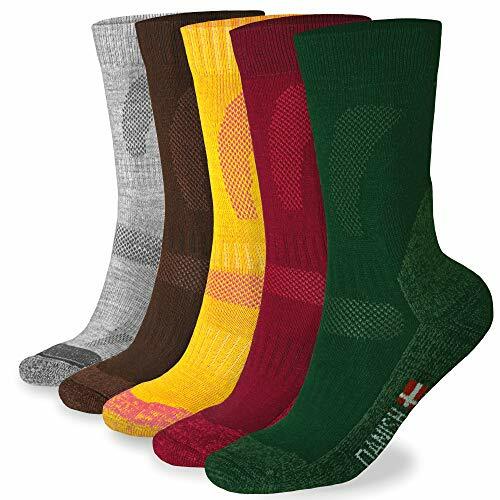 We recommend the Danish Endurance Merino Wool socks. Check these hiking socks out here! As mentioned, what to wear with hiking boots is dependent on the specifics of the trip, including the duration of the trip, the weather and how rigorous the trail is. As long as you think everything through and have a well-thought-out plan in place, you will be able to remember all that is needed and stay prepared while out on your hiking adventure. It is also important to know how to take proper care of your hiking boots to ensure they do not need any major repairs or to be replaced entirely too soon. While hiking boots are naturally very durable and able to resist a lot of potential damage, they are still vulnerable to wear and tear as they age. However, certain things can be done to make the most out of your hiking boots and ensure they last for years without needing to be replaced. Perhaps the best way to ensure your hiking boots last for as long as possible is to store them properly, meaning do not leave them outside in poor weather as the material can begin to damage and become less durable. Instead, save your hiking boots indoors in a safe location. While out hiking, your boots are likely to come across numerous obstacles that can cause them to become incredibly dirty. Now I know what you're thinking - hiking boots are meant to be dirty - the appearance is not the issue. When hiking boots accumulate mud, sand, and other grime, it can affect the material and cause the shoe to age faster than expected. It can also be helpful to ensure your hiking boots are properly repaired when damage occurs, which should include replacing the soles, shoelaces, etc. promptly. Lastly - and perhaps most importantly - the best way to ensure your pair of hiking boots lasts a long time is to buy a durable pair with a trusted reputation and backed with. 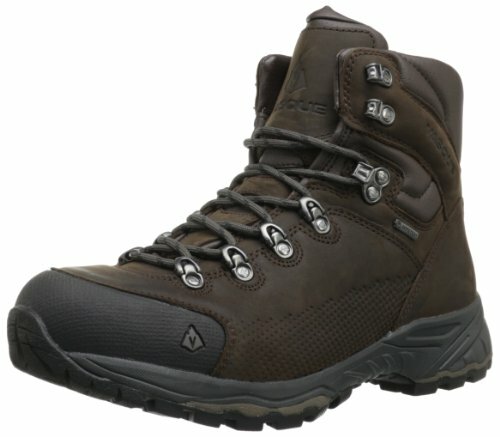 As long as you understand the exact purpose for your boots, the conditions in which they will be used and run each pair you consider through the hiking boots checklist, you can feel confident that you are going to end up with a quality pair that lasts for a long time and perform well while hiking. Throughout this guide, we have discussed the importance of understanding what your exact needs are, which is important to ensure you are comfortable and able to effortlessly make it through each hiking adventure. However, you should also consider your personal preference as well. A common mistake hikers make when purchasing hiking boots is not getting the right size, so be sure to measure your feet in the evening - and not the morning - to determine your size as feet to tend to swell as the day wears on. If you plan to hike in climates where rain or snow is a possibility, make sure you purchase hiking boots - and socks - that are water-resistant. At the end of the day choosing the best hiking boots comes down to making the most practical decision and choosing a pair that is comfortable, keeps you safe and is able to endure rigorous terrains, rather than ensuring they look good and others are going to like them. By gaining an understanding of your needs and preferences, making a list of several possibilities and ensuring the hiking boot you choose meets the criteria laid out in the hiking boots checklist above, you can put yourself in a position to find the right pair of hiking boots that last you for years and help you enjoy numerous hiking expeditions. To further ensure you find a pair of hiking boots you love, be sure to check out our lists of the best hiking boots currently on the market. While you do not have to choose a pair of hiking boots from the list, you are certain to get a pair that is of high-quality and is dependable for years to come by doing so. While you are here, go see some of our outdoor trips and guides to bring your boots!